Family Fabaceae. Peas are legumes and possess the “nitrogen fixing” quality that is so prized in legumes. Here’s how it works. 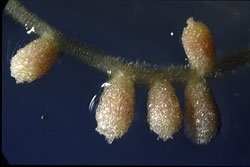 Legume nitrogen fixation starts with the formation of a nodule. A common soil bacterium, Rhizobium, (PART OF A HEALTHY SOIL FOOD WEB, FOLKS) invades the root and multiplies within the cortex cells. In this beautifully symbiotic relationship, the plant supplies all the necessary nutrients and energy for the bacteria that it needs. In return, the happy bacteria release nitrogen back to the root in a form that is easily used by the plant. Within a week after “infection”, small nodules are visible with the naked eye. In the field, small nodules can be seen 2-3 weeks after planting, depending on legume species and germination conditions. When nodules are young and not yet fixing nitrogen, they are usually white or gray inside. As nodules grow in size, they gradually turn pink or reddish in color, indicating nitrogen fixation has started. Peas are grown for either their edible seeds or pods traditionally…but don’t forget the tender shoots. These lil’ sprouts are now prized by gourmet chefs – professional and home alike! Garden or English peas, grown for their seeds, are harvested as soon as the pods are well-filled but the seeds are still tender and sweet. When small and tender, these peas can be eaten raw in salads. For cooking, shell them just before using and cook immediately. Some suggested garden pea cultivars are Thomas Laxton, Wando, Freezonian, Frosty, Knight, Sparkle, Green Arrow, ‘Alderman’ or ‘Tall Telephone’ has been a popular heirloom variety for many generations, ‘Lincoln’ another tall heirloom has good heat resistance and does well in the south, ‘Little Marvel’ is a popular early producing dwarf variety. Snow peas or sugar peas have edible flat pods and very small seeds. They should be picked when very young, just as the seeds start to form. If not picked at this stage, they can be shelled and eaten as garden peas, but are more starchy and not as sweet. Commonly grown cultivars of snow peas include ‘Mammoth Melting Sugar’ is a reliable disease resistant snow pea, ‘Sugar Snap’ and any of its improved hybrids make excellent edible podded bush plants, Dwarf Grey Sugar, and Oregon Sugar Pod. Sugar snap peas are also an edible pod pea but have larger and sweeter seeds and a thicker pod. They are grown to full size and then eaten like snap beans. Suggested sugar snap peas cultivars include Sugar Daddy, Sugar Ann (dwarf), Sugar Snap, and Super Sugar Mel. Garden peas and snow peas have both climbing and low-growing varieties. Sugar snap peas grow on tall vines that require the support of a trellis. Peas grow best in cool weather and should be planted in early spring or late summer. The ideal mean temperature for growth is 55–65°F (13–18°C). Young pea plants can withstand a little frost, though frost may damage the flowers and pods. As a winter crop, peas tolerate temperatures down to 28°F (-2°C). The best soils for peas are silt loams, sandy loams, or clay loams. Peas generally tolerate both sandy and heavy clay soils. I just want to emphasize that proper drainage has to be provided as peas will not thrive well. Peas grown in wet soils develop a shallow root system, and when the soil dries, the root system will be insufficient to absorb enough water to sustain plant growth. Root rot is also a common disease in cool, wet soils, and is a major problem in early season peas. Peas are very sensitive to soil compaction, so it is best to avoid working the soil when soils are wet. Peas are fairly sensitive to soil acidity and the optimum soil pH range for pea production is 6.0 to 7.0. The flavor of different pea varieties can vary from site to site and from year to year. To ensure good- tasting peas, it is especially important to track and, if necessary, adjust soil pH and soil fertility to meet specific pea needs. A NOTE ABOUT BUYING NURSERY TRANSPLANTS – If you are buying transplants at a local garden center, select stocky, sturdy plants that have 3-5 sets of true leaves. Although it’s tempting…avoid plants that already have flowers and fruit. If you have no choice, be sure to remove the flowers before transplanting. This will signal the plant to shift its energy from it developing fruit to developing new roots. 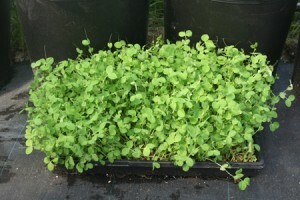 Water plants thoroughly after transplanting. Avoid planting under conditions that will stunt the plants and lead to poor production, such as cold weather, lack of sufficient soil moisture, or lack of sufficient fertilizer. Weed control is essential especially in the first six weeks after planting. Shallow cultivation and hand-pulling are the preferred methods. The soil should be kept evenly moist. Overhead watering should be done early in the day to reduce the incidence of leaf diseases that occur when the leaves remain wet overnight. An organic mulch about two inches deep will conserve soil moisture and reduce weed problems. Sow seeds about one inch deep and two inches apart in the row. If you growing in rows, low-growing varieties can be grown in rows 18 to 24 inches apart. Climbers need three feet between rows, or plant a double row six inches apart on either side of trellis. If you have invested the time and energy into building and maintaining a healthy soil food web, inoculating your soil before planting peas should not be necessary (please see blog “What is in a teaspoon of soil”). If you are unsure, in addition to adding compost you can inoculate pea seed immediately before seeding to ensure an adequate supply of nitrogen-fixing bacteria. Use a fresh, effective, live culture of the correct strain of Rhizobia. There are many different species of such bacteria, each a specialist. Farmers typically buy individual varieties, but most inoculants sold for home garden use are a blend of organisms designed to work well on the most common home-grown leguminous crops: peas, beans and soybeans. If you are inoculating seeds, use this guide from North Dakota University: http://www.ag.ndsu.edu/procrop/pea/fipeip03.htm. The best way to ensure that your soil bed has a good amount of naturally occurring nitrogen is to use cover cropping as a pre-season preparation. I stress that just by adding organic matter such as well-rotted manure or compost to the soil you will increase the level of nutrients, improve soil microbial activity, and increase water-holding and nutrient-holding capacity. Organic matter also improves the physical condition or texture of the soil for cultivation and improves soil structure so the surface of the soil does not crust. Any soil can be/should be improved through the addition of organic matter. As HGEL has often advised, cover crops are also an important, inexpensive way to add organic matter to the soil, and much of plants N needs can be met via cover cropping. Before applying fertilizer it is always a good idea to do a soil test so that you know exactly what is in or isn’t in your soil. Contact your local County Extension office for information on soil testing. Fertilizer may either be broadcast and worked into the soil before planting time or side dressed two inches to the side and three inches below the seed at the time of planting. A later side dressing, after pods begin to form, may be necessary if plants appear yellowish or are not growing well. Insect pests of peas and beans include aphids, Mexican bean beetles, leafhoppers, seed corn maggots and mites. Pea diseases include powdery mildew, root rot and wilt. Crop rotation of peas and beans in the garden is crucial to reduce the incidence of soil-borne diseases that can build up over time. Harvesting Garden Peas – Garden peas should be harvested when pods are fairly well filled but still with waxy bright green color. The raw peas should taste sweet. Harvest lower pods first. Consistent daily picking increases production. Harvesting Snap Peas – The older the snap pea, the sweeter – up to a point. Harvest snap peas before they touch each other in the pod for the sweetest flavor and crunchiest texture. Pods should appear crisp, slender, and bright green, with immature peas. If you prefer the individual peas, you can allow snap peas to continue to ripen to when the peas in the pod are the size of garden peas. At that point, the pods of the snap pea will be too tough to eat. Storing Peas – Peas are best when used quickly after harvesting, but they can be refrigerated in plastic bags, and will keep for 2 to 4 days. Both garden peas and snap peas can be frozen, canned, or even dried. They will keep for up to 12 months in any of these forms.